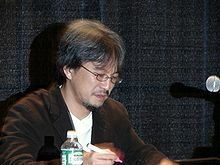 Eiji Aonuma (青沼 英二, Aonuma Eiji, born 1963) is a Japanese video game developer for Nintendo. He is most well known for his work in The Legend of Zelda series, most recently with The Legend of Zelda: A Link Between Worlds on the Nintendo 3DS. ↑ "今度のゼルダは「ダンジョンがたいへん」らしい。その１". 「ゼルダの伝説　時のオカリナ」の情報・産地直送！. Hobo Nikkan Itoi Shinbun. 28 November 1998. Retrieved 27 June 2010. ↑ "ニンドリドットコム〜ゼルダの伝説 夢幻の砂時計 開発スタッフインタビュー〜". NINDORI.com. August 2007. ↑ McWhertor, Michael. "The Legend of Zelda: A Link to the Past sequel coming to Nintendo 3DS this holiday". Polygon. This page was last changed on 19 March 2016, at 19:29.